Progressive Engagement is currently considered a promising practice, which may be promoted to a best practice as data emerges to support this innovation in personalized client care. Progressive Engagement is the practice of helping households end their homelessness as rapidly as possible, despite barriers, with the most effective and efficient use of resources. What distinguishes this approach, however, is that more supports are applied to those households who struggle to stabilize. While all households enter with equal initial services, such as housing location assistance, move-in, rental assistance, or case management, the amount of assistance fluctuates later on depending on the needs of the client or households in need of assistance and their ability to stabilize, within the limitations of available funding sources. Every community and household is different which effects their prioritization. We primarily assess for housing barriers. We expect that every household will be successful with Rapid Re-Housing. Case managers are often best advisers on how to administer assistance. We are bad predictors of stability. 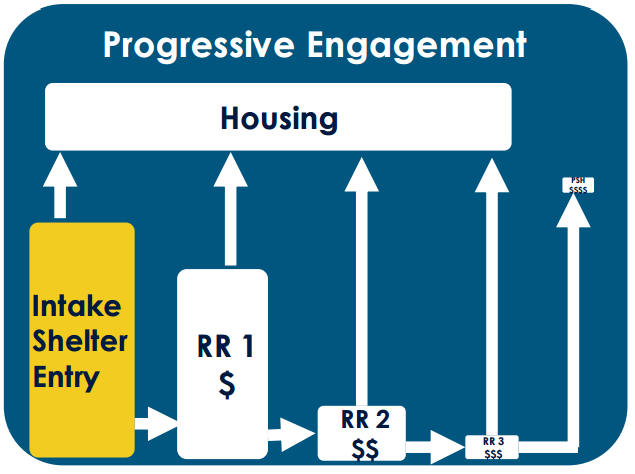 The theory of Progressive Engagement can be applied in a variety of approaches, however this model shows how it is paired with Rapid Re-Housing. Rapid Re-housing support continues to increase as needed. Only if a home cannot stable after receiving the full extent of support are they considered for Permanent Supportive Housing.